Summer is all about the simple, right? There’s such an abundance that planning a meal becomes moot, and your food comes together easily with a few ingredients, a nice olive oil to drizzle, maybe even served on a paper plate so that we can get back outside. Back to summer and enjoyment. I’ve been on a creative kick with fruit, as evidenced by that gorgeous and frightfully easy Strawberry Balsamic Vinaigrette, and when blueberries went on sale at a local grocer, I stockpiled them, dropping them on yogurt, in cereal, atop pancakes and just about any other vehicle to my mouth that one can imagine. Nothing like fresh blueberries. 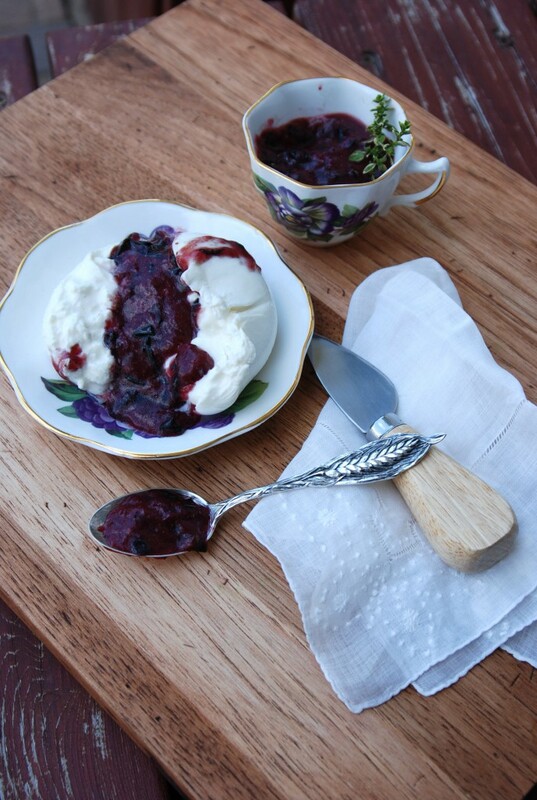 And there is nothing quite like this Blueberry Compote, resplendent with Lemon Thyme and fresh lemon juice. Coupled with a fast and furious love for the cheese within a cheese known as Burrata, and an ongoing affair with the tender and tiny striped leaves of the Lemon Thyme plant, I took a leap of faith on the perfect marriage of lemon and blueberry and created this quick topping that complimented the creamy cheese to utter perfection. On a hot day, breaking open a ball of fresh mozzarella, watching the dreamy interior slip in to the bowl, mixing with the dark, deep blue of the berries, this was a quintessential summer treat. It’s made to cool down the sultriest of days. It doesn’t require much else than a spoon, really. Or good toasted bread, because really, anything tastes good on toast, doesn’t it?? And toast is a much easier means to achieving a good meal than any other base as it goes well with just about anything placed on top of it. I think a good loaf of cinnamon bread would be ideal for this creamy, berry-filled treat. Aren’t familiar with Burrata? It’s a ball of fresh mozzarella that’s filled with shreds of MORE fresh mozzarella that’s soaked in rich cream. It’s cheese, and then some and every bit of it is rich and satisfying. It’s a nice appetizer, a perfect salad option (think good grilled veggies awash in that phenomenal cheese bath) or a delightful dessert. At upscale grocers, you should be able to find it with the other fresh mozzarella products in the deli. All that’s left to desire is a warm, lazy day and the need to fill the belly. 1/2 c. fresh blueberries, washed. Mash berries in a glass measuring cup and stir in the lemon thyme, lemon zest and juice. Allow to stand for a while in order to blend the flavors. Whisk in the oil, add salt and pepper to taste, and more lemon if you wish. Chill thoroughly. The mixture will thicken as it cools, due to the oil. Whisk it again before serving to loosen. In a bowl, carefully place one Burrata and using a spoon, break it open down the center, allowing the creamy middle to spread out. Spoon the chilled compote over the Burrata, drizzle a little oil over it and a thin pinch of good sea salt. Grab a spoon. Oh, I usually do basil with blueberry but now I want to try the lemon thyme. I had never heard of burrata before; now I can’t wait to get my hands on some to try with the compote… it looks and sounds delicious!